I’ve got a great guest post for you today, looking at the top ways you can improve your home before selling it. I hope you find it useful – enjoy! Why is it we think more about improving our homes just before we sell? Don’t we deserve to live in updated, spotless houses too? Now is the time to update and improve, whether you’re selling or not. If you leave it until you’re ready to move, the task will be all the harder. The people whose ideas you can trust on home improvement are professional house buyers. They’ve seen it all and know what works. Here are five of their top tips to make your home more comfortable, and easier to sell. Go through the house and try to see it as if for the first time. Pay particular attention to kids rooms, kitchens and the bathroom. We overlook the faults and defects we live with so this is a useful exercise in identifying cluttered areas. Be fussy about personal effects. For instance, choose a couple of family photos instead of having a shelf full, and do the same with ornaments. No only will your rooms look more spacious, your personal items will have more impact when they’re not lost in clutter. Colour scares many people, so they opt for a bland neutral interior. Neutral is good because it provides a restful atmosphere, but too much is boring. Splashes of colour bring a room alive, making any space feel more vibrant and uplifting. If your decor is currently a bit beige, begin by identifying a colour you like in a permanent feature in the room, such as a picture. Echo that colour with accessories like cushions, candles, lamp shades or rugs. Progress to statement décor such as feature walls when you’re comfortable with the small stuff. Stick with similar shades and hues and you won’t go far wrong. When displaying ornaments or other decorative objects, think in odd numbers. They always look more sophisticated when they’re grouped in threes or fives. Making sure they also relate to each other also creates a winning combination. Home staging puts house sellers ahead of the pack. But it can also work for you while you’re living there. The principle of staging is to project a lifestyle and you do this by organising rooms according to their use. You could keep the dining room table clear of clutter so it’s ready for a meal, or create a dedicated desk area in a teen’s room. Both are easily arranged, and earmark areas for particular activities. In effect, you’re setting the stage and inviting that activity. Tend to the outside of your home. Does the garden need weeding or the lawn want mowing? Could the front door do with a lick of paint or a good scrub? Are your door numbers sparkling clean? Not only does a tidy exterior give your home curb appeal, it gives you a little lift every time you come home. Tackle all those niggling little DIY jobs you’ve been meaning to get round to. Squeaky hinges, ill-fitting doors and scuffed paintwork are easy to fix. Taken one by one they’re small defects, but add them all up throughout the house and it means there’s something to fault in every room. Go room by room and spend just a little time each week putting things right. 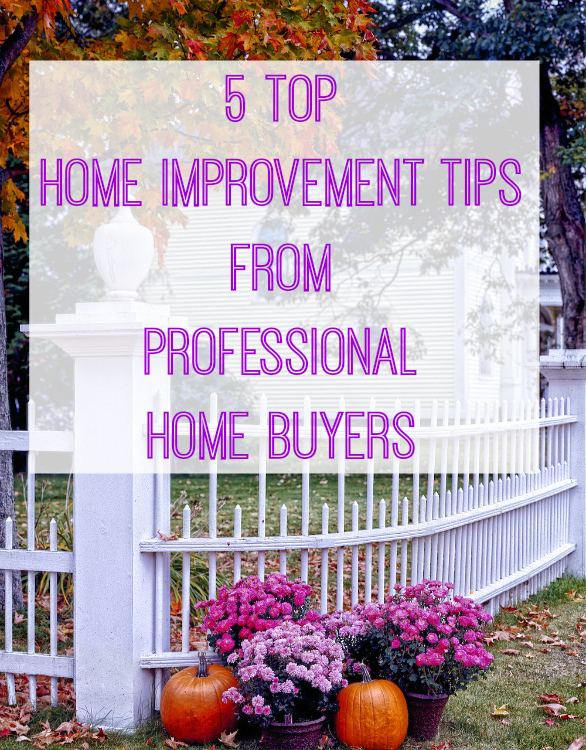 Tackling those five areas of home improvement doesn’t cost a lot but works magic throughout the house. Not only will your home be more comfortable and inviting, when the time comes to sell, you’ll be ready. Drew writes for Black Brick, a Buying Agency based in London. Very good tips! A new coat of paint on the walls and some good clearing can do miracles with your property. Some very useful tips! Nothing too difficult that can really make a difference.